Create an account on the RevenueBot website. Log in to your account and follow the “Referral Program” link. Choose the appropriate advertising link/slogan/banner. Pay attention to your referral link. Create personal recommendations and promotion for RevenueBot using the Internet: website, forums, social networks, newsletters and other tools. Get a reward for all profitable trader’s transactions. Withdraw funds upon accumulation or use the balance to pay for your own bots. It is beneficial — a service fee is charged depending on the profit and it is equal to 20%. This is beneficial for customers with a small deposit. The maximum commission is only 50 USD (per month) in BTC equivalent, which is beneficial for customers with a large deposit. The fee is deducted from the internal RevenueBot account. It gives great opportunities — you can create as many bots as you like with different settings and trading pairs and launch them on several cryptoexchanges at the same time. There are predefined trading strategies, start filters, automatic pair switching according to specified indicators, the ability to save your presets, and you can also conduct a trading simulation using the data from the past 60 days. It is safe — the users’ funds are kept in their accounts on crypto exchanges. RevenueBot does not accept, does not keep, and does not have access to the funds for withdrawal, and only uses them to place orders on the exchange. It is profitable — the bot algorithms are break-even (the Martingale trading system is used) and, with the correct settings, make it possible to earn a stable profit of 0.2-0.7% of your deposit per day. In addition, you do not need to spend a lot of time monitoring the bot’s work. Two work algorithms are available — LONG (the bot first buys the asset in parts when the price drops, then sells everything bought when the price rises) and SHORT (the bot first sells the asset in parts when the price rises, then buys everything sold when the price drops). Flexibility — you can change the bot settings during the working process without stopping it. New settings will be automatically applied at the start of the new working cycle for the bot. If you need promos for banners or teaser ads, contact support. Payment of the referral reward to the Affiliate (referrer, webmaster – this is the name of the user who brings in the referrals) is made upon request in the administrative panel of the website. 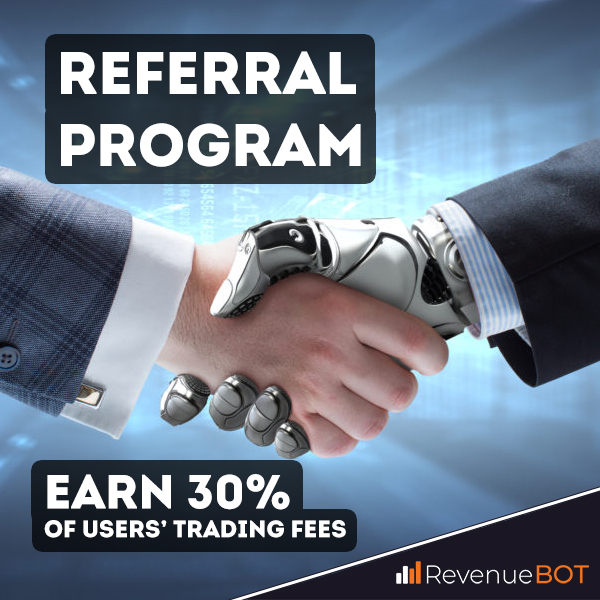 The standard referral rate is 30% of the amount of commission that the user pays for using the RevenueBot. The transition of referrals from one Affiliate to another is prohibited. It is strictly prohibited to send SPAM (in personal messages of social networks, in groups and communities of partners, in e-mail newsletters, forums, etc.) to attract Referrals. 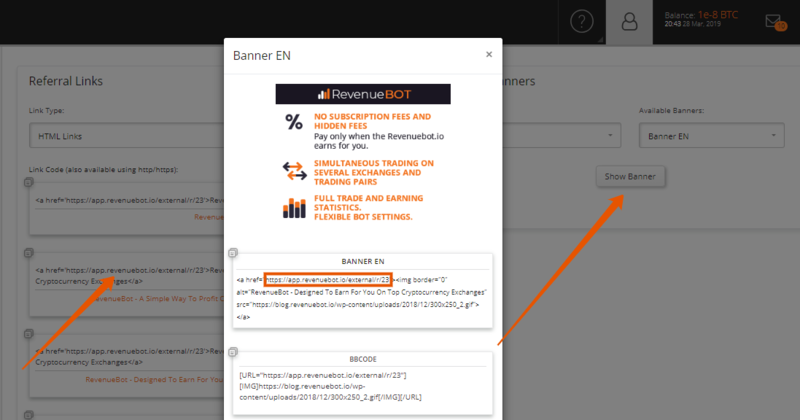 It is strictly prohibited to use the RevenueBot and partner websites brand names as the domain names of websites created to attract traffic for the RP. The RevenueBot reserves the right to change and enhance these terms and conditions or cancel the program in whole or in part at any time without prior approval from the Affiliate.